After revealing a short trailer earlier yesterday, Xiaomi India’s Managing Director Manu Kumar Jain official announced the release of the Mi A2 Red edition in India with the first sale scheduled to start at 12PM today. 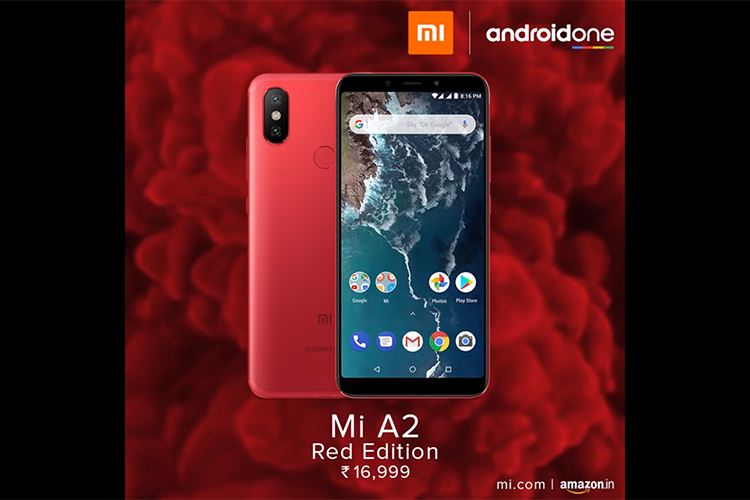 The new red variant of Xiaomi’s second-gen Android One device will be available for purchase on both Mi.com and Amazon India priced at Rs. 16,999. If you aren’t familiar with the device, allow us to give you a quick refresher. The Mi A2 is Xiaomi’s new Android One powered mid-ranger which was launched in the country earlier this year in August. The smartphone packs a Qualcomm Snapdragon 660 SoC coupled with 4GB of RAM and 64GB of internal storage, and runs stock Android 8.1 Oreo out of the box. While the device didn’t quite meet up to our expectation in the performance department, it successfully managed to blow all competition out of the water with its photography chops. In the camera department, the Mi A2 packs an impressive 12MP+20MP dual camera setup on the back, along with a 20MP selfie shooter up front. The Mi A2’s camera prowess makes it one of the best camera smartphones in the mid-range price segment, making it the best choice for anyone looking to purchase a mid-range device with an amazing camera. The device packs in a 3,010mAh battery with support for Quick Charge 3.0 and a 5.99-inch FHD+ notchless IPS LCD display with an 18:9 aspect ratio. Since it offers a near stock Android experience, it comes with great Google Lens integration, unlike any other Xiaomi devices, and also offers free unlimited storage on Google Photos. The Mi A2 is also expected to receive Android 9 Pie later this year and we believe Xiaomi might be able to iron out all the software issues we experienced with our review unit in the forthcoming update. If the company manages to do so, the Xiaomi Mi A2 will become one of the best mid-rangers in the market. Other than the newly launched red variant, the Mi A2 is available in Black, Blue and Gold color variants.